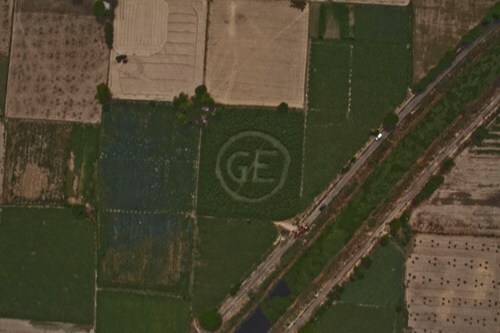 Giant crop circles reported in Najafgarh to warn against the invasion by genetically modified foods. Crop circles in the farms in peri-urban Delhi have startled the people! But they are actually meant to startle the policy makers even as the Government seems keen to introduce the Biotechnology Regulatory Authority of India (BRAI) Bill, which will provide for a single window easy approval mechanism to controversial Genetically Modified (GM) crops. Similar crop circles were formed in Ahmedabad and Bangalore by Greenpeace volunteers who came from various corners of the country to generate public awareness against the ‘imminent invasion of GM crops in India.’ The crop circle initiative by Greenpeace has been undertaken as a symbol of protest against the Government’s decision to introduce the controversial BRAI bill. The BRAI Bill 2011 is proposed by the Ministry of Science and Technology, Government of India as a Bill to ‘promote safe use of biotechnology’ and to set up a new regulatory mechanism for matters connected to biotechnology including research, use, trade and manufacture. However, Neha Saigal, Sustainable Agriculture Campaigner at the Greenpeace, India begs to differ. According to her, the Bill is “India’s Monsanto Promotion and Protection Bill”. “Government is paving a way for the biotech corporations like Monsanto to take control of our food and farming by providing a single window approval mechanism to GM crops”, she clarifies. “While Monsanto’s influence within the US Government is more than apparent, the same is now being ensured by the Indian government here through the BRAI Bill,” added Neha. Monsanto, the largest seed company in the world, has been surrounded with many controversies regarding GM crops around the world. It is also enjoying a monopoly over Indian cotton seed through its proprietary Bt cotton since eleven years. It holds 26% share in the Indian seed company, Mahyco. If it is not stopped, the day is not far when it will be controlling Indian agriculture through its patented genes and seeds. Greenpeace has done a legal assessment of the BRAI Bill and its believes that the Bill proposed by the Government on 22nd April, with much opposition both within and outside the Parliament, is a threat to our food and farming. According to Greenpeace, the Bill serves to promote the interests of companies like Monsanto. A look at some of the provisions of the Bill makes it evident that BRAI Bill is the Indian version of promoting Monsanto Protection Act (U.S.). The assessment by Greenpeace questions the very approach adopted by the Bill as promotional in nature rather than precautionary. The BRAI Bill is also confronted with conflict of interests among the various parties involved with it. An agency unbiased to this issue, yet related to the challenge, like the Ministry like Ministry of Environment and Forests should be chosen as the nodal agency of regulatory body to make the process bias-free. Also, agriculture is a state subject, hence it becomes all the more important to take the State Governments on board and to promote their involvement in activities pertaining to GM crop field trials. However the BRAI Bill does not give any power to the State Governments to reject the introduction of Genetically Modified Organisms (GMOs) including experimental releases through field trials , in their state. The Greenpeace assessment has therefore recommended that the States be given the power to participate in the decision-making process and not just have a recommendatory role. The use of modern technology like GMOs has social, cultural and economic impacts. But the committees and councils constituted under the BRAI Bill takes into consideration only the technical factors, ignoring the inclusion of the expertise for assessment of the former impacts. It is worth noting that given the increasing scientific evidence on the negative impact of GM crops to human health and environment, GM crops developers like Monsanto are averse to independent long term assessment of GM crops. The BRAI Bill carries forward this interest and avoids mechanisms for independent, long term biosafety testing. Also, the Bill does not provide any opportunity to the public to raise its concerns and seek clarification on the limited information that the Bill discloses. The BRAI Bill has provisions which override the RTI Act. 2005 and proposes to exempt biosafety data from being shared with public. The Bill has incorporated a Biotechnology Regulatory Appellate Tribunal (BRAT). BRAT gives the provision of filing a complaint or appeal in the Tribunal for any wrong they feel. However, a pertinent question arises as to whether there is a need for a separate Appellate Tribunal for Biotechnology at all given the fact that the National Green Tribunal set up under the National Green Tribunal Act,2010, is functional and has a wide jurisdiction. The setting up of a new Appellate Tribunal appears to be unnecessary and a replication of the National Green Tribunal’s powers. Given that there is an inherent risk involved in modern biotechnology and its products, the main mandate of the regulatory system should be to safeguard the health of citizens, the environment and consider the various social, economic and cultural aspects. The decision making in such a system should follow basic principles of Indian and International jurisprudence like precautionary principle, absolute liability for hazardous and dangerous activities, polluter pays principle, effective public participation in environmental decision making and access to information. Keeping in mind the United Nations’ theme for this World Environment Day: Think Eat and Save, Greenpeace demands the Government of India should not hand over our food security and sovereignty to multinationals like Monsanto and withdraw the BRAI Bill and instead bring in a Biosafety Protection Regime. Pranay Jasodia, Actuarial Science student of Utpal Sanghvi college in Mumbai, who was among the 20 people who contributed in creating the intricate crop circles of 150X180 size with a slash over ‘GE’, as a mark of protest against the government’s decision of introducing BRAI summarizes, “ Safe food is my right and GM crops are the biggest threat to it”. Interesting article, Ayushi. Very well written.